If I'm going to write about one notoriously nebulous historical concept anyway, why not double down? 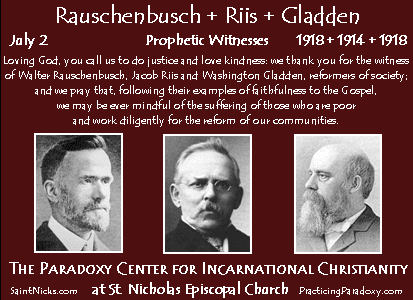 For most people interested in American history, the term "social gospel" probably denotes an informal American religious movement that began sometime around the publication of Washington Gladden's Working People and Their Employers (1876) and faded in importance sometime after Walter Rauschenbusch's A Theology for the Social Gospel (1917). It involved a decreased focus on individual other-worldly salvation and an increased emphasis on applying Christ's teachings (especially in regards to fairness and justice) to fix temporal inequalities produced by the new industrial economic and political order. That basic definition seems to remain the standard introductory description, although a number of questions have (let me apologize in advance for using this word) problematized social gospel historiography since the 1940s. To list just a few issues, historians still debate how radical social gospelers really were, how much continuity existed between social gospel reform and antebellum social reform, and what sort of theology imbued the movement (was it liberal? evangelical? a theology of its own? all of the above?). Then there's the problem of the word "social gospel" itself. Before the 1900s, what we now call the social gospel was often described with terms like practical Christianity, applied Christianity, or social Christianity. As historians have debated and discussed who gets to be included as a social gospeler, they have created an impressive collection of strange bedfellows. While some social gospel boundaries are firm -- for example, the social reform efforts of the Salvation Army, the Church of the Nazarene, and other holiness movement groups are excluded -- the tendency among historians has been to broaden the scope of the social gospel. If only I had the power, I would invite all the individuals who have been labeled as social gospelers to a dinner party just to listen to their awkward conversations and see their shocked faces when I informed them that they were all part of the same reform movement (Thomas Dixon? Please meet Reverdy Ransom). I don't want to be too dismissive, though. Like Janine Giordano Drake, I believe that the social gospel is an important subject to take on. 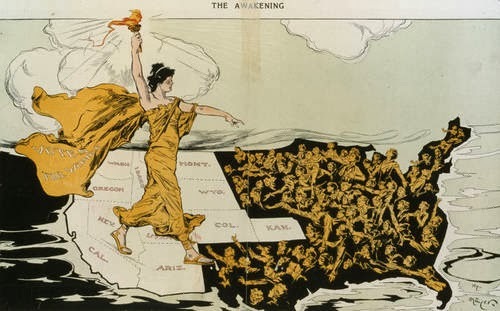 Clearly, there was something going on in the late nineteenth and early twentieth century as more and more Americans sought to address the "social question" and to reshape institutions and the nation in the image of their notion of the kingdom of God. In my mind, more work needs to be done on the social gospel(s), not less. As for the American West, definitional issues abound. Is it a process or a place? If it's a place, where? How should we differentiate between the many Wests? If we can't even figure out what the American West is, how can we take a western regional approach to religion? Quincy Newell covered both the difficulties and potential of religion in the American West in this fantastic (but not open-access) overview. The task before scholars of religion in the American West is indeed great, but so are the possibilities. I read Newell's article earlier this year as I was plowing through social gospel historiography from C. Howard Hopkins to Heath Carter, and I began to wonder what a western view of the rise of the social gospel might look like. Some historians of the American West, like Doug Anderson, have analyzed western expressions of the social gospel and numerous others have written about individual western social gospelers such as Kansas's Charles Sheldon and Iowa's George Herron. Usually, though, Sheldon and Herron are written about it an "oh, and they happened to be from the Midddle West" way. As it is with most aspects of American religious history, scholars rarely incorporate a robust western perspective on the social gospel. Questions go unasked. How did the specific context of American West communities shape social gospel expressions? What impact, if any, did western forms of the social gospel have on those in other parts of the country? Was there even a distinct western social gospel? In regards to the last question, Ferenc Morton Szacz answered with an emphatic "yes." In both The Protestant Clergy in the Great Plains and Mountain West, 1865-1915 (1988, reprinted in 2004) and Religion in the Modern American West (2002), Szacz laid out the characteristics of a western social gospel. In Protestant Clergy, he listed three specific western distinctives: "the establishment of Chinese schools; aid for immigrant health seekers in the Southwest; and the popular ideology of social ethics created by Topeka Congregationalist Charles M. Sheldon." In Religion in the Modern American West he expanded on his earlier examples, but also took to using the term "Gospel-In-The-World" interchangeably with social gospel. I appreciated Szacz's attempts to identify a western social gospel, but his analysis was somewhat problematic. For example, Szacz did not explain how Sheldon’s urban Great Plains context might have inspired a distinct western form of popular social ethics. Were Sheldon’s popular social gospel novels really all that different from those further east? If so, how did the West shape those differences? As for health seekers, the mountain West undoubtedly attracted visitors for health purposes. But it is unclear how improving individual health might be connected to a social gospel that sought to Christianize institutions. Too often, Szacz seemed to equate any charitable work with the social gospel. On the other hand, Szacz pointed to three promising social gospel themes for the West. I'll briefly discuss those three, and then add two more possibilities. 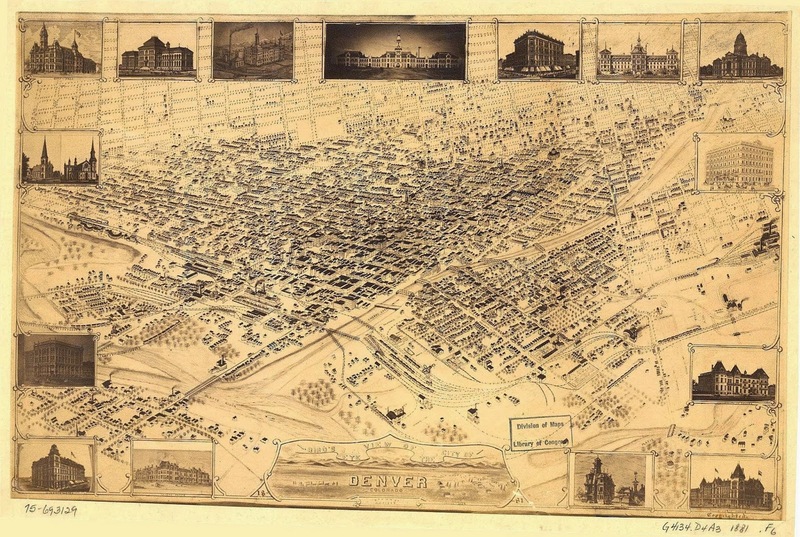 1881 Map of Denver. Accessed via USGWarchives. 1) Szacz suggested that in the chaotic world of pre-social gospel western cities, clerics became de facto civic leaders. When the social gospel came along in the late 1800s it simply reinforced western ministers' already-existing role of meeting the temporal needs of their community. Of course, this notion of continuity assumes that the social gospel was driven by the clergy. Heath Carter paints a different story of the social gospel, as do some historians of the Populist movement (see below). Even so, social gospel efforts in the suddenly booming postbellum western cities, which lacked the infrastructure and established order of their eastern counterparts, might be worth analyzing. Ralph Luker and Ronald C. White Jr. brought race to the forefront of social gospel history in the early 1990s. To move beyond their "social gospel in black and white," scholars should look West. 3) Szacz argued that western cities were especially favorable to ecumenical social work. In Denver in the 1890s, for example, a group of Protestant, Catholic, and Jewish leaders, united in their interest in advancing the kingdom of God, agreed to exchange pulpits. 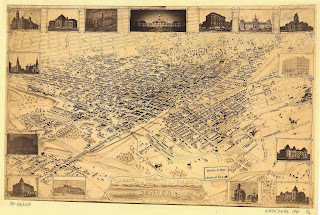 Myron Reed, a Congregationalist minister in the city, summed up the ecumenical spirit he tried to foster in Denver, recalling “I saw a Jewish rabbi, a Catholic priest, an Episcopalian rector and a Congregational parson in one carriage going to the burial of a newspaperman who belonged to no church.” Of course, social gospel efforts in the East were also marked in some cases by a similar ecumenical spirit, so any analysis of western social gospel ecumenicism would need to compare western and eastern urban settings. 4) Beyond the potential social gospel distinctives mentioned by Szacz, at least two more possibilities should be considered. First, the West was more conducive to women's suffrage than any other region in the U.S. Perhaps the increased political freedom afforded to women in the West shaped the forms that the social gospel took, or led to increased female leadership in social gospel activity. Although women were heavily involved in church-related societies and organizations, they also played a prominent role in groups not affiliated with a specific denomination. For example, the national Women's Club Movement that emerged in the late nineteenth century became an important part of most urban settings in the West, and it allowed women to consolidate their forces in local settings in the interests of Christianizing the local social order. The five possible themes for western social gospels mentioned above are only cursory. Feel free to pass along any comments or suggestions, especially if you have any examples of scholars who have articulated a distinct western regional social gospel perspective (i.e., not just an individual biography of a social gospel westerner). I'd also be interested to know of any scholars who, in the process of discussing the broad social gospel, have made it a point to incorporate a western perspective. In the meantime, be on the lookout for upcoming work related to the social gospel from Heath Carter, Janine Giordano Drake, Curtis Evans, and others. If you need a refresher course or an introduction to the issues related to the social gospel, this article from Elna Green at the (open-access!) Journal of Southern Religion includes an overview of the state of the field as well as a good collection of footnotes for further reference. Social Gospel faded in importance? Is there any historic narrative that would trace its importance to the present day? There is some debate on that point, but many historians see World War 1 as, at the very least, the beginning of the end of "The Social Gospel." Whether the social gospel was drowned out by militant nationalism, or, as Susan Curtis argued, its task as a transitional movement for middle-class Americans to deal with new social and economic realities was complete, few historians argue for a long social gospel (which might make it ripe for a historian to come along and challenge the narrative). Historians point to the New Deal as their proof, arguing that by FDR's presidency, secularized progressivism had clearly replaced the religious activism and reform activity spawned by the social gospel. They also highlight the blistering attacks from the Christian left made by the Niebuhr brothers, which were part and parcel of a rejection of the optimistic postmillenialism that gave the social gospel much of its fervor. However, it's clear that many social gospel ideas continued, and historians have to contend with what is often called the "social gospel tradition." The emergence of the civil rights movement on the national stage in the 1950s and 1960s spawned renewed interest among historians in the social gospel, particularly when leaders like King were citing Rauschenbusch as an inspirational figure. As a result, in the 1960s and 1970s there was a revival of sorts in social gospel historiography. You might want to check out Gary Dorrien's massive book published a few years back, titled "Social Ethics in the Making." Dorrien connects the social gospel with a continuing century-long tradition of Christian social ethics. His narrative stretches from the nineteenth century to the present day. Thanks for the link to my site amidst your overview. Folks can find pdfs of my various Western (essentially San Francisco Bay Area) Social Gospel articles on the Miscellaneous page at my blog.